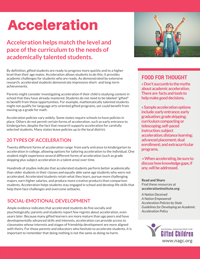 The purpose of the Acceleration Institute website is to inform parents, educators, researchers, and policymakers of the research and practices concerning academic acceleration. Our discussions of academic acceleration include grade skipping, early entrance to kindergarten or college, moving ahead in just one subject, and other ways of moving a student ahead to more challenging coursework. Summary of the research on acceleration: A Nation Deceived. This watershed report summarizes the research and best practices on academic acceleration. Download for free. This is powerful information to share with school personnel if you are advocating for acceleration for your child. An extensive list of resources from A Nation Empowered, Volume 2. The National Association for Gifted Children (NAGC) produced a Tip Sheet for Parents on Academic Acceleration, written by Drs. Keri Guilbault and Ann Lupkowski-Shoplik. 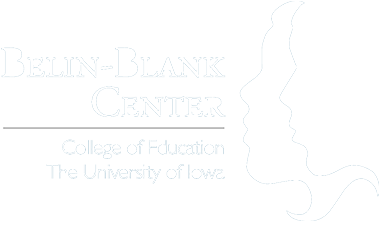 Belin-Blank Center blog about the Go-To Resources on Academic Acceleration.